As with most villages in Karabakh, the day here ends when it gets dark. In the evening the village goes into deep slumber as residents start switching off lights. Just 40 minutes away in Stepanakert, nightlife begins in bars, discos, cafes and the broad streets are lit by bright shops inviting strollers to visit Mango, Sela, Ecco and other foreign brand-name retailers whose goods once would have seemed a dream on those shell-shocked streets. Just as there are “two Armenias” – Yerevan, and all that is outside Yerevan – so are there stark differences in life and lifestyle between capital Stepanakert and the villages that make up the self-declared republic. While in the capital Wi-Fi internet access connects Stepanakert to the world, in villages communication includes the warning of barking dogs and the alarm of morning roosters. And while days begin sooner and end sooner, the hard work goes on and on . . . Vineyards stretch along a section of the Martuni region’s highway, leading to the village of Sos, which is known for its wine varieties. The village that has a history of about 150 years, today has around 1,056 residents who went through the crucible of war to continue to live and build their native village up. Sos village mayor Hunan Grigorian says that people in the village are mainly engaged in growing wheat, corn, barley and buckwheat. Sos also has mulberry orchards. Generally, horticulture, especially grape-growing, is quite developed in the village. Almost all villagers have their own vineyards, but many say the wholesale price at which grapes are purchased from them is not very profitable. “Agriculture is the most unpredictable sector of the economy. One year you may have nothing and the next year such bumper crops that people would have problems selling all their produce,” says the mayor. This year the price of wholesale grapes was a penny or two higher than last, and villagers made enough to pay off debts. “But no one knows what will happen next year,” says Grigorian. Like other villages in Armenia and Karabakh, Sos’ age demographic is a concern. Young people see little future in village life. Those who can, leave. Naira Mangasarian, 58, who has worked as an educator at the Sos village’s kindergarten for 38 years, voices concern about the growing out-migration of young people. The village is building a new kindergarten, however, the teacher says the number of children of pre-school age in the village decreases each year. The veteran teacher says that even during the years of war the kindergarten never closed its doors, but today only two kindergarten groups are functioning, with 46 children attending. Before the war there were more than 100 pre-school age children in the village. “Our villagers are very hard-working people, there are many gardens and orchards, there are privatized lands. But the harvest is not always good. People don’t know what to do to get results from their work. There isn’t any establishment or factory, and young people need jobs to keep them in the village. That’s why young people want to go to towns and cities,” says Mangasarian. Sos’s secondary school has 175 students, while before the war the number of students was nearly 300. The only place for leisure for local young people is a ping-pong hall recently built near the village administration office. Since 2009 the village has also had an Internet club with six computers. But there are also young people in the village who are taking small steps towards the world of business. Artsakh State University history department student Artsakh Manasian has been engaged in grape-growing and winemaking for several years now. “I have two hectares (about 5 acres) of vineyards, and I supply some of the yield to Stepanakert’s brandy factory, and I use some to make wine myself,” says the 23-year-old villager. He adds that soon he is going to make a 3.5-million-dram (about $8,500) business plan for the construction of a wine cellar that he says even at the initial stage will create two news jobs. The village of Drmbon, sits near the Tartar River and about 20 miles to the southwest of the Martakert regional center. It is there that during the first days of the Karabakh Liberation Movement volunteer militia groups were formed and beginning from September 1992 they participated in defense and liberation battles in Martakert and Askeran as part of the Martakert defense units. Drmbon has about 320 residents, some of whom raise cattle. But the majority of the local residents are employed by Base Metals of Valex Group, founded in 2002, at a copper and gold mine not far from the village. While deposits in the Drmbon mine are running low now, the company continues to remain one of Karabakh’s largest taxpayers, accounting for up to 15 percent of tax revenues (in 2007, some 45 percent of tax revenues in Karabakh were ensured due to the company). The company works on a 24-hour basis, providing employment not just to Drmbon residents and other residents of the Martakert province, but also to many from Armenia. Environmentalists in Armenia and Karabakh often voice concerns about damage caused by the mining industry to the local environment, however those issues are weighed against the more pressing matter of employment. Base Metals Technical Control Division head Ararat Ghardian says that the company today employs 1,340, with average monthly salaries of 180,000 drams (about $450) – nearly double the average Karabakh salary. “We have employees from every district in Artsakh. Ninety percent of the [working-age population] from nearby villages work at Base Metals,” says Ghardian. Lusine Barseghian, a 20-year-old resident of Kochoghot village, Martakert province, has worked in a Base Metal laboratory unit for two years. She combines work with her studies. “I get a monthly salary of 70,000 drams (about $170), I can pay the fee for my studies and also have some money left for daily expenses. I wouldn’t be able to work or study if I remained in the village,” says Barseghian. Goghtanik is a happy, if slow-growing exception, to the trend of villages getting smaller. The village, founded in 1995, is situated about 18 miles from Berdzor, the regional center of the NKR district of Kashatagh, on a slope of one of the three gorges stretching northward. The current village mayor, Lusya Baghdasarian, is from Yerevan. Along with her family she moved to Karabakh in 1996. “My husband participated in the war and he always used to say that the important thing wasn’t only liberating those lands, but also keeping them by living there,” says Baghdasarian, adding that she has already forgotten the hardships of the years when there was no transportation from the village towards the regional center and, if absolutely necessary, they had to go on foot to get to the town. “When we had just moved to our new place there were only five families in the entire village, but now we are 23 households, and five of them are large families, some raising even as many as eight children,” says the village mayor. Some of those large families participated in a mass baptismal in Berdzor in October, where more than 50 children from surrounding villages were baptized. Today Goghtanik is home to 108, and the village’s secondary school has 27 students, while just three years ago, it had only six. The community leader says that the number of students in the village will increase soon as the birthrate is now on the rise. However, the village doesn’t have a kindergarten, a community club or a health center. There isn’t even a proper village administration office in Goghtanik. “For the village administration office we are using part of our house until we see what other space we can get. All issues will be solved in the course of time. In the meantime it is important to keep the village,” says Baghdasarian, adding that a majority of Goghtanik’s population are young people, who earn their keep from raising livestock. 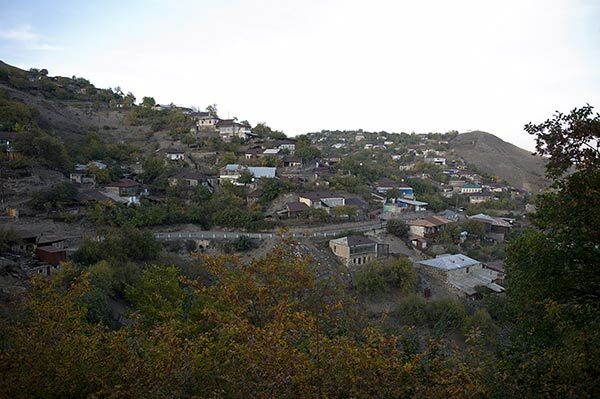 The largest village in Karabakh, Chartar, is only a few kilometers from Sos in the Martakert province. The village with more than 2,000 residents has the appearance of a military regiment, as most of its adult males are contract military men. Chartar residents say proudly that their village has produced the highest number of senior military officers. A part of the cultural house in the center of Chartar, which looks like a smaller model of the Soviet-built Aram Khachatryan Philharmonic Building in Yerevan, has served as an art school since February, 2011. Five departments of the school are attended by 170 students both from Chartar and surrounding villages. Classes at the school are free. Next to Chartar is the Martuni region’s Khnushinak village, where the scars of war haven’t healed even more than 18 years after a ceasefire that brought fragile peace to the region. Khnushinak’s 35-year-old resident Senorik Sargsian’s ancestral house was destroyed in a bombing during the war. For more than ten years now together with his wife and four children he has rented homes from his relatives and friends. “Although the house was destroyed with a Grad missile, in the initial period we still could live in it, but a strong wind ripped its roof off, and we narrowly saved the children out of the wreckage,” says Sargsian, who adds that he has repeatedly applied to relevant state bodies for help getting a home, however he hasn’t heard back yet. In Khnushinak, which has 645 residents, the Sargsian family is not the only one that remains without their own home and has lived in difficult social conditions after the war, but the village mayor says that there is almost no emigration from the village. Wheat and grape cultivation are the main livelihoods. “In 2012 we harvested more than 570 tons of grapes, while in previous years the harvest did not exceed 470 tons,” says village mayor Hamlet Tevosian as he pours home-made bubbly champagne-like wine into glasses. Khnushinak’s school is attended by 100 students, who also participate in different interest and activity groups. In the evening in the renovated gym of the school the village youth gather for volleyball games to prepare for regional competitions. As the sun goes down, men in villages such as Khnushinak usually gather in some central location, such as near a store, to exchange news of the day and talk about other developments, enjoying the last evenings of the ending velvet autumn. When on the night of April 10, 1992 the Markosian family was fleeing their village, barely escaping death at the hands of advancing Azeri forces, little did they know that years later they would settle down in a new village, tens of kilometers away from their native one, but named after it. Misha Markosian, now 72, was one of the last residents of Maragha who managed to escape almost unscathed from what was a massacre of Armenians, with his last glance at his native village and house imprinted in his mind till today. “We owned a two-storey house with everything in it; four rooms upstairs, four rooms downstairs. We left all our property and belongings there and ran for our lives,” says Misha Markosian’s 63-year-old wife Susanna as she wipes tears from her cheeks. “At first we stayed for a few days in an abandoned Azeri village where we found a bed and a map of Baku. We spread the map over that bed, I was wearing soft slippers, and we used them as pillows and slept somehow. We kept axes next to us all the time to defend ourselves if Azeris came,” remembers Susanna. A majority of re-settlers in Nor (“New”) Maragha, a village founded in 1995, share similar fates and bear a heavy burden of pain and the feeling of refugees who had lost everything. Most of them came from Maragha, Margushevan, Leninavan and other villages that fell under Azeri control during the 1992-1994 Karabakh war. In 2000, as part of the Karabakh resettlement program, new residential houses were provided to residents in Nor Maragha, while several houses left by Azeris had been rebuilt. “When we were running away, by night, with my grandchildren in my arms, under missiles flying over our heads, without even a hope of surviving, little did we imagine that one day we would have a home again. But in 2000 we celebrated the New Year in a new house, with new hopes and expectations,” says Misha, whose house is in what is called the upper district of Nor Maragha which now has 400 residents. Misha and Susanna live in a two-room house with a balcony. The Markosians’ children (they had three, but one died in an accident), like many, left for Russia immediately after the war and have remained there. The Markosians say they have a good life. From time to time the children send money from Russia, but the couple’s needs are met mostly by living off New Maragha’s fertile land. They also have four cows, chickens, and more than two dozen sheep. Not far from the Markosians’ house is a one-storey school that was built in 2004. The school in Nor Maragha, which was establishment as an institution in 1997, today has 22 teachers and 71 students. Until 10 years ago the number of students was no more than 35. The school’s 56-year-old principal Lyuba Grigorian moved to Nor Maragha from the Armenian town of Metsamor in 2000. She went there as part of an Armenian government program that provided housing and salaries for teachers who would relocate to Karabakh. Grigorian says that the village expands from year to year and its conditions are improving. “The position of our village is very good. It stays green 12 months a year. In general, there is no better place than Artsakh. We feel very good here, our only concern is that there is no war again,” says Grigorian. According to the school principal, Nor Maragha’s children are very smart and every year’s graduates manage to enter colleges or universities. Some have returned from university to teach in the village school. Until 2003, Nor Maragha was still considered to be a “danger zone” because of landmines left after the war. Villager founder Vazif Hambartsumian was killed by a landmine in 2000. But by 2003, the village had been completely cleared of mines thanks to British charity Halo Trust’s de-mining projects. In the middle of Nor Maragha there are two village stores arranged side by side. One of them, however, shut down recently because of failing to make a profit. Retailers in this Karabakh village, just like in villages in Armenia, have several thick copybooks called “debt lists” with names of villagers who owe money to the shop. Behind the shops is an old building that had survived a bombing. Now it serves as a village administration office. And in the distance there is a small area occupied by the village cemetery, the resting place, so far, of about two dozen villagers. There are more than 50 children of pre-school age in Nor Maragha, but the village has no kindergarten. And young people are mainly engaged in farming, while some are contract-based military servicemen. And although life in Nor Maragha continues to move forward, local residents still deeply feel the sorrow of the past events imprinted as wrinkles. The same wrinkles cover a cherished hope that one day they could return to their native villages and see their original homes again. “Today, in Nor Maragha, we have very good conditions. Our house is very good, I like it very much. Thank God, we have everything, the house, the land… We started everything from scratch, now we keep livestock, cultivate land, but like swallows we still want our old nest,” says Nor Maragha’s 52-year-old resident Violeta Dumanian. She is originally from Leninavan, which is now under Azeri control. She then starts counting out how many graves of relatives they left behind in their native village . . .